I’m with Nellie. My trip couldn’t have been so successful … or even ever happened…without the ‘kindnesses’ shown by so many. I send my heartfelt thanks to the countless people en route who helped me along the way and also to all those who generously donated to UNICEF through my Footsteps of Nellie Bly page. I must first acknowledge the support from my husband David Stanton and daughter Acadia. David helped me design my itinerary, plot the flights and pack my small suitcase so everything fit. Best of all they both believed in what I wanted to do. Also on the home front, thank you to Anna Barfield and Janet Goodman for the lovely bubbly send-off at Heathrow. Barbara Richardson, Liz Khan, Susan Lacy, Christina Watson, Vicky Webster, Dinah Nichol and Patsy Puttnam also spurred me on, as did everyone in my freelance writing course at City Lit led by Susan Grossman. Alan Taylor contacted our friend Nikhil Hirdaramani who introduced me by email to his lovely friends in Colombo. I am delighted that Women in Journalism endorsed my trip and the Royal Geographical Society registered it. Many thanks to Michael Blunt, Vice-President of Corporate Communications at oneworld Alliance who asked his airline colleagues en route to offer assistance if necessary. Happy to report that I never needed to call on them because everything went smoothly. Nellie Bly herself travelled with a similar ‘letter of introduction’ from ocean liner officials. Louisa Peat O’Neil (r) and David Stanton at the Newseum, Washington DC. Louisa Peat O’Neil gave me good advice from the start. She’s always been an inspiration. Back in 1980, she embroidered Rainbow of the Road on my bright yellow backpack and sent me off. Alice Robbins-Fox, a terrific travel companion who keeps me on track, met me in New York City to share the journey and her birthday. Sally Emery made connections there and helped us plot urban itineraries. 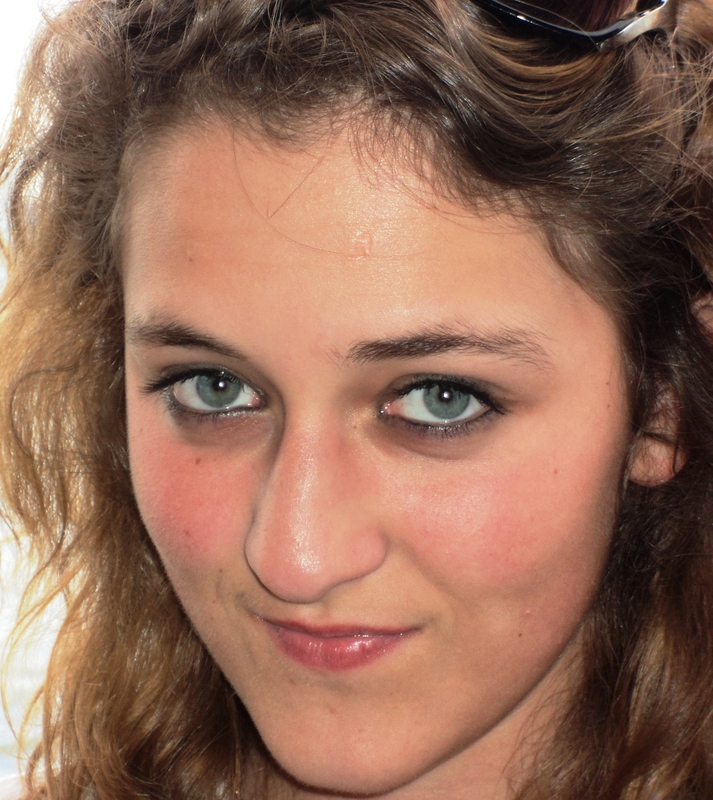 Victoria Fulmer offered to come around the world with me…as long as it was on a private jet. Pat Streifel and Vim Maguire helped pave the way. Dolly McCo y and Arnold Blystone took me to explore Nellie’s birthplace in Cochran Mills, Pennsylvania. Donald and Marilyn Schlief kindly offered their apartment in Washington, DC so we could visit the Newseum that features Nellie Bly. Kristina Heintz‘ birthday card to me featured a dancing girl with the words ‘she could no longer deny the gypsy in her soul.’ Perfect. My trip was enriched by the writing and research of Brooke Kroeger — Nellie Bly: Daredevil, Reporter, Feminist and Matthew Goodman – Eighty Days. The Stapels family and guide at the Royal Botanical Gardens. Thanuja Kanchana Camlo Lanka Tours met me at the airport in Colombo and managed to extract my credit card from the machine that swallowed it – rescuing my source of funds for the rest of the trip. Lakmini, Jevon and Devin Raymond; and Steffi and Moahan Balendra pulled out all the stops to show me the best of Colombo. Nushka Nafeel wrote about Nellie for the Sri Lanka Daily News. 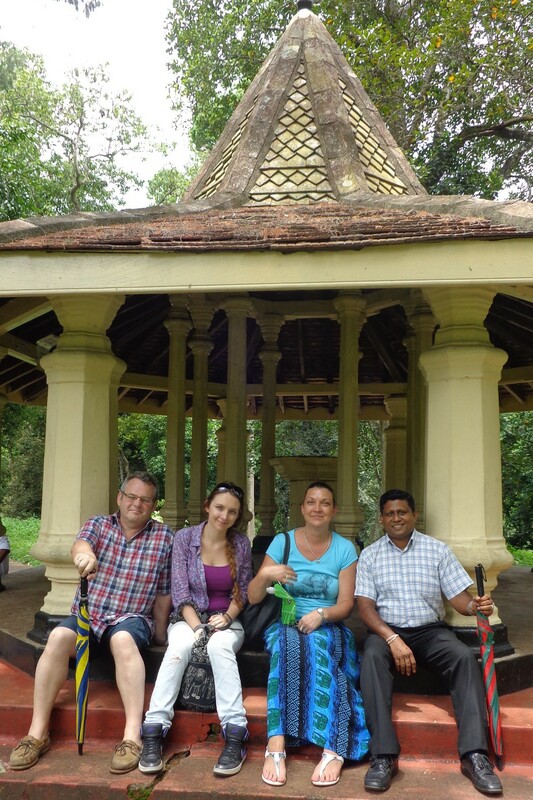 The Stapels family — Bernie, Redda and Julia from Germany — invited me to join them and their guide in Kandy and together we visited the Royal Botanic Gardens that so impressed Nellie. Folks at the Adler Hostel helped me to map out itineraries taking in all of Nellie’s sites. 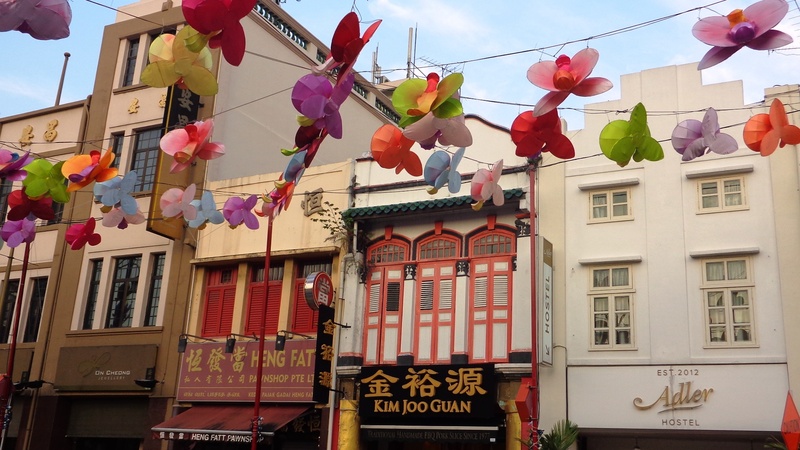 Stephen Wang at the Your Singapore Tourist Information Office provided tons of history and organised a tour of the Fullerton Hotel with Florence Minjout who shared her knowledge about Singapore in the 1890s. 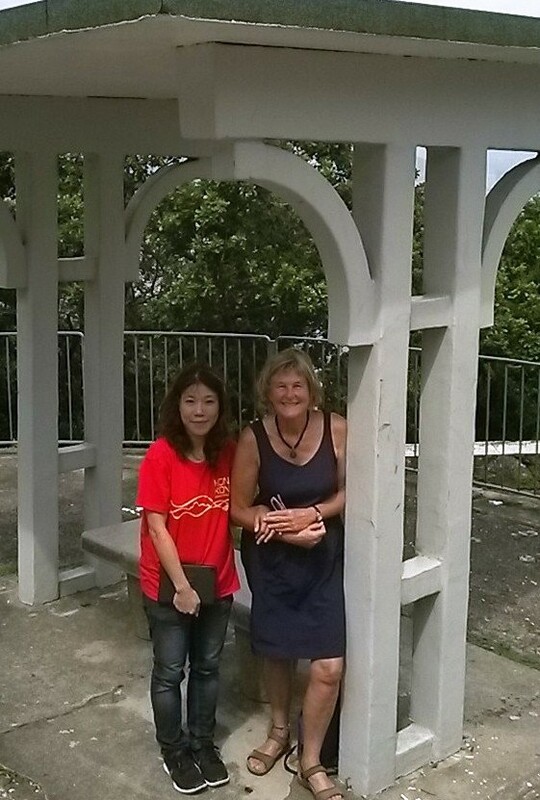 Sanford Lee, Windy Chiu and Chung of the Hong Kong Tourism Board based at Victoria Gap joined my quest to find the umbrella seat where Nellie rested on her way to the peak. Windy and I trekked to the top and found it! With the generous help from the team at the Customs Hotel, I was able to find obscure Nellie sites. Business man Joe Yang not only gave me directions, but delivered me to the Nanyue King’s Tomb Museum. 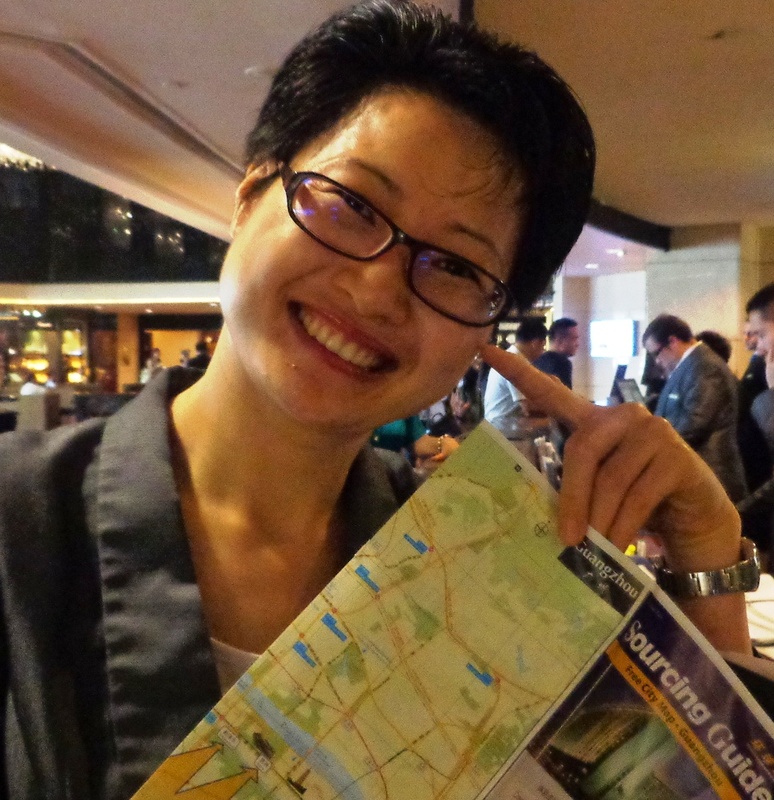 Jenny at the Hilton Hotel near Yuexiu Park gave me a map, advice and sent me off in the right direction. 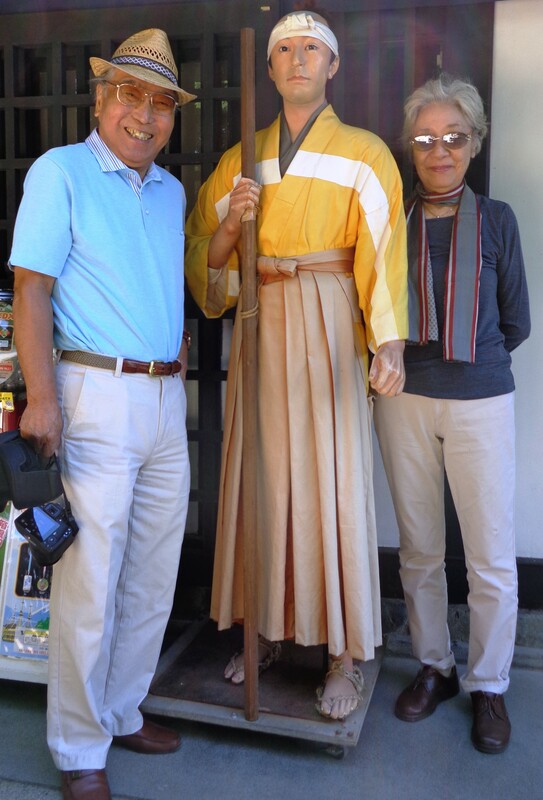 Yoshihisa and Yoshie Togo in Hakone. Yoshihisa and Yoshie Togo whisked me off to Hakone with spectacular views of Mount Fuji and Kamakura with the Great Buddha Diabutsu. L Peat O’Neil (r) and David Stanton at the Newseum. Washington DC. Washington DC was not on Nellie’s world trip itinerary, but it had to be on mine. 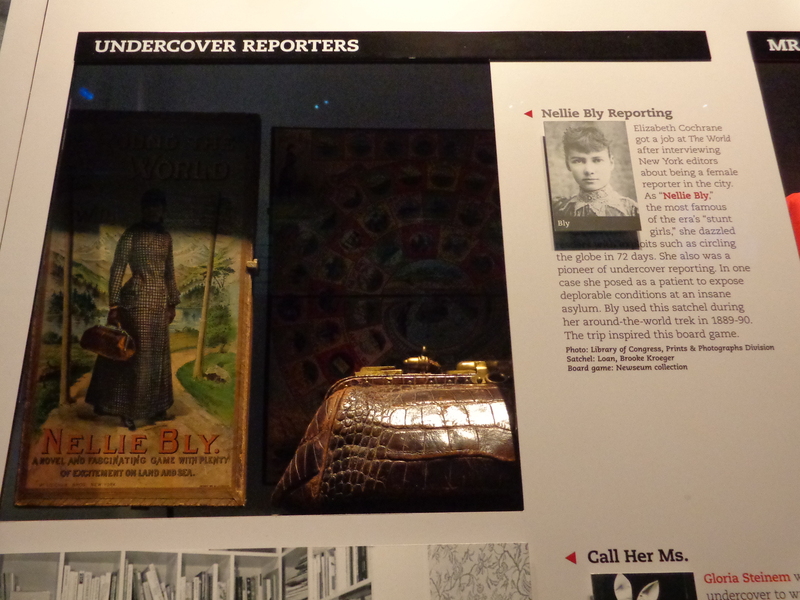 The satchel she carried around the world is on display at the the Newseum there, courtesy of Nellie Bly biographer Brooke Kroeger. I had to see it. Adjacent to the Capitol, the Newseum transports you across five centuries of journalism through multi-media presentations, hands-on exhibits and galleries. I’d been hoping to be able to carry Nellie’s satchel or gripsack as she called it — just for a minute — but it’s well- protected and inaccessible inside a Plexiglas display. Even so, it was exciting to see an icon of her epic journey that so totally captures her spirit. When Nellie’s editor said he’d have to send a man around the world because a woman required a chaperone and innumerable trunks, Nellie showed him by stuffing everything she needed in a 16×7 inch satchel and travelling alone. Go Nellie. Aside from her own display, Nellie stars in a 4-D ‘film experience’ designed to introduce us to the power of journalism. It recounts the 10 days she spent in the Blackwell’s Island Insane Asylum for Women in New York and the reforms that followed her exposure of the cruelty there. It was terrific to see her role in investigative journalism celebrated so vividly — even if we had to endure shaking chairs and flashing lights to ‘heighten’ the 4-D experience. Nellie is in good company at the Newseum with exhibits monitoring press freedom, a memorial to fallen journalists, a large section of the Berlin Wall, front pages from around the world and vivid Pulitzer-prize winning photographs. 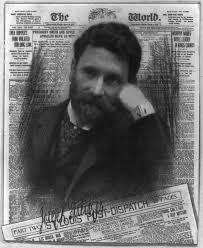 The legendary Joseph Pulitzer, creator of the prizes, was the owner of The New York World and Nellie Bly’s boss. 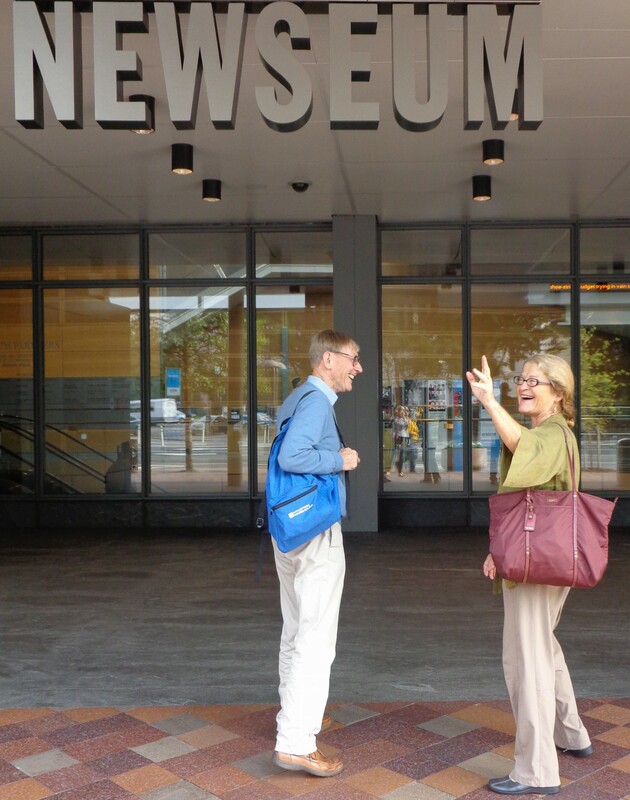 I visited the Newseum with my great friend Louisa Peat O’Neil, a travel writer and former journalist at The Washington Post, and my husband David Stanton who flew over from London. We were met by Peat’s friend John Maynard, Senior Manager, Exhibit Progamming at the Newseum.